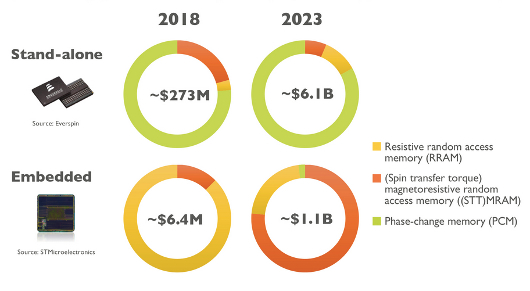 This will represent about 83 percent of an annual stand-alone emerging non-volatile memory market worth about $6.1 billion in 2023 up from $273 million in 2018. 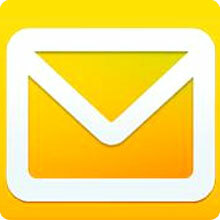 This is a compound annual growth rate of about 86 percent. The CAGR will be higher for PCM which is forecast to take market share at the expense of spin torque transfer magnetoresistive RAM (STT-MRAM). Stand-alone resistive RAM (ReRAM) is expected to move from an almost insignificant amount of sales in 2018 to a healthy but distant second place to PCM by 2023. 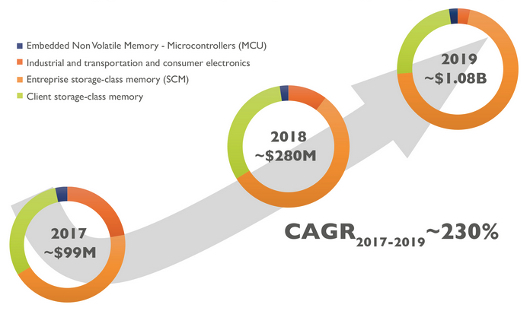 Emerging non-volatile memory market broken by technology market share in stand-alone and embedded applications. Source: Yole Developpement. "Although momentum is building around emerging NVM for embedded applications, stand-alone memories will be the dominant market, which will be mainly driven by SCM enterprise and client applications," said Simone Bertolazzi, an analyst at Yole, in a statement. DRAM scaling will continue for the next five years but at a slower rate than previously, according to Yann de Charentenay, senior analyst at Yole. NAND flash memory capacity will also keep increasing thanks to advancements in 3D integration. So emerging NVM will not replace stand-alone DRAM and NAND flash but will complement them in combination memories. ReRAM was expected to be the first stand-alone technology to compete with 3D XPoint, but it has suffered repeated delays due to technical challenges, Yole said. Leading proponents of stand-alone ReRAMs are Crossbar Inc. and Nantero Inc. Emerging non-volatile memory break down by application. Source: Yole Developpement. Yole asserts that ReRAM could compete again for SCM sockets after 2020. STT-MRAM thanks to high-speed and high endurance is also promising but suffers from greater fabrication complexity, according to Yole. In contrast, for the embedded market for emerging non-volatile memory STT-MRAM is gaining momentum for microcontrollers. All the major foundries are getting involved in this area, said Yole (see TSMC embedded MRAM is key to Gyrfalcon AI chip). The embedded emerging NVM market is small compared to the stand-alone market, representing about 3 percent of the emerging NVM market in 2017. However, all top foundries are preparing STT-MRAM offerings at the 28nm or 22nm nodes whereas ReRAM has been delayed by approximately two years by SMIC and UMC. Yole forecasts that by 2023 STT-MRAM will represent about three-quarters of a $1.1 billion annual market with most of the remainder going to ReRAM technologies. It is not clear how Yole measures the embedded memory market as the value of the memory is wrapped up in the selling price of microcontrollers and SoCs in which the memory is embedded. Yole gives PCM little market share as an embedded NVM. STMicroelectronics is so far the only company to announce an intention to use the technology. next text: ： Can Magnetic Memory (MRAM) Replace SRAM and DRAM? We are the authorized agent as designated by NETSOL、JSC、EVERSPIN、VTI、IPSiLog and Sinochip.And Lyontek.so on.